Two minds, four hands and an 8mm lathe. 15-17 Regent Place, Birmingham, B1. British husband-and-wife watchmakers, Craig and Rebecca Struthers, trained as vintage and antique watch restorers and goldsmiths. With 30 years’ industry experience between them, the Struthers are emerging as one of the leading forces in independent British watchmaking. 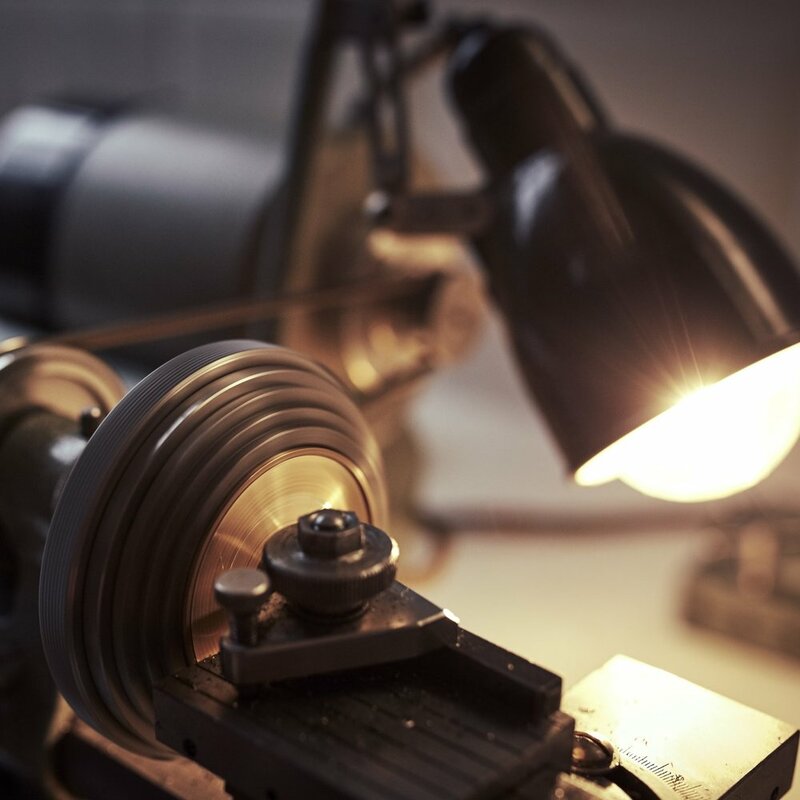 The Struthers are inspired by traditional English horology and goldsmithing, and are known for their restoration of vintage and important watches, as well as their own custom built watches based around remade and refinished antique movements. For their first in-house movement, the Struthers will be developing a new improved English lever escapement, picking up where the British industry left off in the late nineteenth century. Whilst the Swiss have dominated watchmaking for nearly 140 years, the English lever escapement has been largely ignored; the Struthers will revive this traditional escapement using the latest advancements in materials and technology. The movement will incorporate several features inspired by historical watchmaking and lost to modern, scale production methods – including an English rocking bar keyless work, parachute shock setting, slow 16,200 beat, and gold jewel chatons secured by screws. The design of the top plate has been inspired by an English pocket watch from 1880 in the Struthers’ historical movement collection. The Struthers’ Georgian workshops and studio are in the former property of celebrated British industrialist James Watt, which has also been the home to Britain’s oldest family goldsmiths, Deakin & Francis, since 1786. The prestigious address of 15-17 Regent Place, B’ham will be a feature exclusively limited to the Struthers’ in-house movements, hand engraved across the top plate in the traditional English style. This movement will be produced entirely in-house, except for the main and hairsprings, screws and some of the jewels. Nicknamed “Project 248” for being the product of two watchmakers, their four hands and the 8mm lathe they almost exclusively use for their work, the formal name of the Struthers’ first in-house movement has not yet been decided. To create an object that has integrity and quality throughout, Craig and Rebecca Struthers proudly work with a network of extraordinary craftspeople. The movements will be decorated by celebrated master engraver Florian Güllert who works with fellow Birmingham-based luxury makers Westley Richards & Co.; and the box will be made by award-winning Scottish cabinet makers Method Studio who have previously worked on projects with Vacheron Constantin, Burberry, Hamilton & Inches and Fortnum & Mason. The focus of all the Struthers' work is the owner of the watch, as it is the owner who brings an object to life by using and caring for it. The first group of wrist watches will be strictly limited to five pieces only, and the Struthers are inviting five passionate collectors to participate in the project – giving design input, wearing and testing prototypes, and helping to name the final watch. The watches will be cased in yellow, white or rose gold, with each collector choosing their case metal. To follow the creation of our first five watches keep an eye on this page or, alternatively, connect with us on Instagram, Facebook or Twitter. For more detailed information on the project, or to request a place on our waiting list, please contact us using the form below.